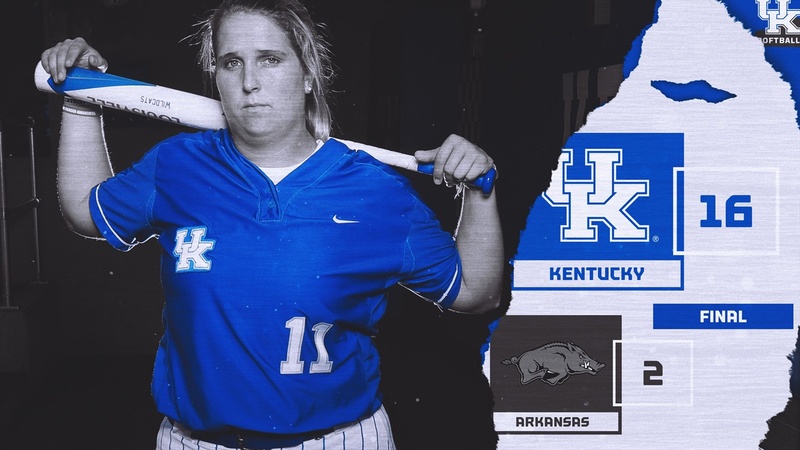 Kentucky snapped their 5-game losing streak after scoring a season high 16-runs to defeat Arkansas 16-2 to even up the series Saturday afternoon in Fayetteville at Bolge Park. Kentucky gets on the board first on a wild pitch scoring two runs. (UK 2, Arkansas 0). Kentucky scored again on a hit and Arkansas error. (UK 3, Arkansas 0). Katie Reed drove in a run singling up the middle. (UK 5, Arkansas 0). A Home run by Mallory Peyton gave Kentucky a 10-0 lead in the second inning. (UK 10, Arkansas 0). Arkansas got their only two runs in the bottom of the 2nd inning. (UK 10, Arkansas 2). A home run by Abbey Cheek, her 11th, put Kentucky up 9. (UK 11, Arkansas 2). Another home run from Abbey Cheek gave the Cats their 16-2 win.